Everyone seems to know the score – the Belgians win again! On a weekend when a confident England lined up a World Cup semi-final place alongside Belgium and France in football, it was perhaps an omen that a Belgian club, led by a French player, dominated the honors at the FISTF Harrow International Open in London. Frenchman Remi Soret, playing under the colors of Belgian club AS Hennuyer, won the individual title and was part of the team event’s winning side. 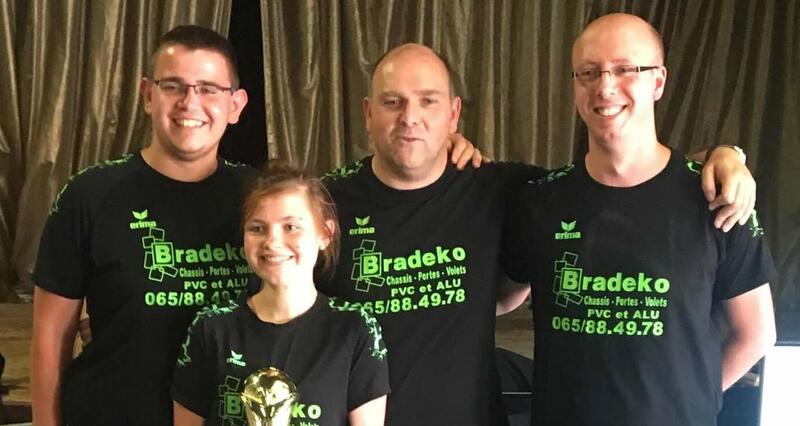 And his Belgian teammates, the brother and sister duo, Steffen and Emilie Despretz, both reached the semi-finals of the main event, Oliver Pere made the last 4 of the veterans, whilst Corentin Boltz took the under 15 title, as Hennuyer claimed three of the weekend’s prizes. It was only in the veterans’ competition that they missed out, as David Busch was in fine form, beating Marco Ghigliotti 9-0 in the quarter-finals, Pere 6-2 in the semis, before defeating top seed Daniel Scheen 5-2 in the final. Soret meanwhile had to come through a tough quarter-final against Mark Farrell in the open section, scoring a last-minute winner, to turn a 2-1 deficit into a 3-2 success. He then beat Emilie Despretz 3-0, to set up a final against Austrian Christian Blumel, a 4-2 winner against both Paul Andreas and Steffen Despretz in the preceding rounds. There, a game of few chances came alive midway through the first half when Blumel went ahead via a clever free-flick routine. Soret hit a superb equalizer minutes later, crisscrossing and weaving through his opponent’s defense on a moving ball, before hitting a chipped shot into the top corner. The pair traded chances before halftime, but just 45 seconds after the break, Soret went ahead after a well-worked move down the left wing was finished with a calmly chipped effort on goal. Blumel applied pressure, forcing a couple of good saves, and hitting the crossbar, but midway through the half, the Hennuyer player extended his lead with a low shot, instigated from a short free-flick. Soret hit the crossbar, and Blumel forced another good save before the game was effectively ended with four minutes to play when Soret scored a fourth with a looping effort from the right wing. With Hennuyer’s players so dominant in the individuals, the focus of the team event was on who would play them in the final. As it was, The White Star edged out their domestic rivals, Harrow Hawks, on goal difference in their semi-final clash, after finishing two individual wins apiece. Panos Stemitsiotis and Paul Andreas edged Phil Homes and Jeremy Bradley, respectively, by a single goal for the host club. But after Andy Boyer’s late winner – against the run of play – versus Rudi Peterschnigg, Mark Farrell’s 4-0 victory over Paul O’Donovan-Rossa was enough to give White Star the overall victory on goals. The English team put up a fight in the final, with Bradley playing out a scoreless match versus Steffen Despretz and Farrell settling for a 2-2 draw against Soret, having led 2-0, via two fine strikes. However, Emilie Despretz’s 3-0 success against Phil Holmes and Oliver Pere’s hard-fought 1-0 against Boyer gave Hennuyer a 2-0 match win. So whilst football may be coming home, the trophies from England’s latest table football event were going to Belgium and France.